cables, fibre optic cables, etc. Present subsurface excavation methods in solid rock include dredging, ripping and blasting,which in many cases extensively disturb the biological environment in which they are utilized. One major objective in developing The Miah Underwater Trenching System included reducing environmental damage while subsurface work is being accomplished and to be able to restore the ocean floor to close as possible to its natural state. than conventional methods. This trenching system has successfully trenched hundreds of kilometers around the world. 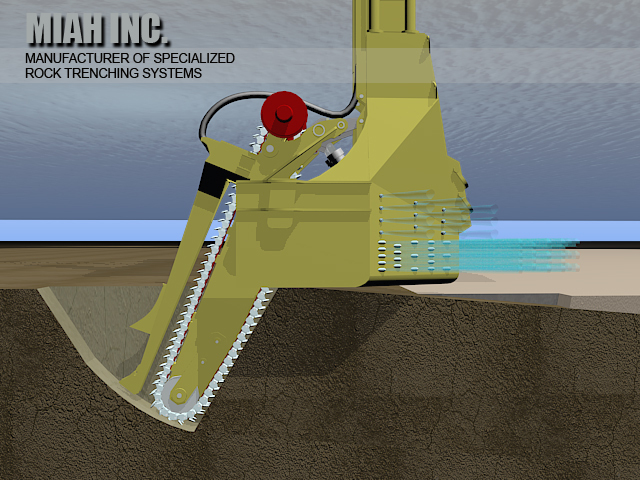 The rock trenching sled is basically comprised of a hydraulically driven cutter assembly mounted on a sturdy steel structured foundation which is pulled along the ocean floor during operation by a barge on the surface and assisted by the Miah Powered Stabilizer Chassis tracking behind the cutter chain in the trench bottom. Power is supplied by a power unit mounted on the vessel through an umbilical to the rock trenching sled. The sled is equipped with a high pressure water injector system which removes overburden on top of the solid rock strata enabling the sled to sit on the rock surface. surface and assisted by the Miah Powered Stabilizer Chassis tracking behind the cutter chain in the trench bottom. enabling the sled to sit on the rock surface. This system can be utilized with the Miah Prefatigue Trenching System with the Powered Stabilizer Chassis.